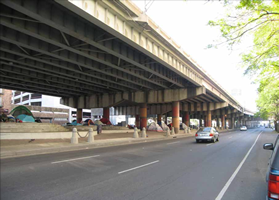 UrbanCincy: Nola tearing down the elevated I-10 over Claiborne? This topic is always a popular one with those in the Urban Planning/Design profession, and with a new planning interest in New Orleans post-Katrina the recipe might be just right for the demolition of Interstate 10 through the Treme neighborhood. Like many urban neighborhoods of the early to mid 20th Century, Treme was a once vibrant, unique and local that centered around its grand North Claiborne Avenue. What happened was the injection of the interstate system that plowed through Treme like many other neighborhoods including Cincinnati's West End and downtown area. 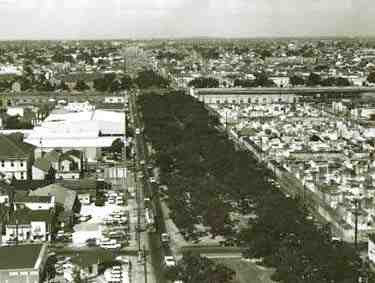 The transition in Claiborne was even more intense as a grand boulevard was replaced by an elevated highway which facilitated the downward spiral of the neighborhood. Many older Nola residents remember North Claiborne Avenue as being the "black people's Canal Street." This is important as French Quarter activists were able to block a highway from tearing through their neighborhood which left the Treme neighborhood vulnerable to the interstate system's wrath...and with that North Claiborne Avenue was gone. Cincinnati narrowed and buried its Fort Washington Way that connects I-71 with I-75 through the heart of downtown and its riverfront property, but could this have instead been removed with traffic instead utilizing the underused Central Parkway and Liberty Street, or even connecting via I-275? What about the Norwood Lateral that ate up the right-of-way that had been preserved for Cincinnati's planned subway system? These are important questions as Cincinnati examines how it is going to handle the $1 billion reconstruction of the Brent Spence Bridge, $1 billion reconstruction of I-75 through the Mill Creek Valley and considers the options of upgrading US 50 West to highway status via the 6th Street Expressway through Queensgate, and even possibly extending I-74 east through the city and its eastern suburbs so that it could eventually connect to Washington D.C. per the original Interstate Highway Plan - both of which present untold hundreds of millions (potentially billions) of dollars of public expense. It's sad sometimes how poorly these interstates were planned with no regard for the future. There's a big block of abandoned churches and houses in the west end that we were exploring last week when all of the sudden one gentlemen popped out of a house that seemed abandoned with his dog. He asked us what we were doing and explained how he had lived in Cininnati's west end since I-75 had been built through it. "It absolutely killed this neighborhood" he said. Although Fort Washington Way is about a million times nicer now than it used to be, it's still a shame that more thought wasn't given to eliminating it altogether. It doesn't really serve any function that I-275 or the Norwood Lateral doesn't already serve, and its elimination -- in addition to allowing downtown Cincinnati to re-connect to the riverfront -- would also eliminate or greatly reduce the two spaghetti junction interchanges at either end of downtown. Assuming that FWW is here to stay, the city should at least get serious about decking it over with a nicely-designed park. That would greatly enhance the appeal of The Banks, the Central Riverfront Park, and the riverfront sports venues. I'd have to look it up, but there's a nice example in Seattle where a freeway was decked over to create a park. I'm hoping that someday the section between the trench and Lytle Tunnel can be redone and the entire Downtown section burried. Here in Milwaukee we did remove the Park East Freeway spur that cut off part of downtown. Redevelopment of the land that was actually in the footprint has been slow but there have been a couple related projects that were very significant. Further traffic congestion did not go up in fact it went down a little bit after its removal. There is now discussion of eliminating some more freeway ramps to better connect our city. Good luck to NOLA and Cincy on your efforts. I agree with Travis. Damn shame it wasn't possible to bury the whole Eastern section of FWW.